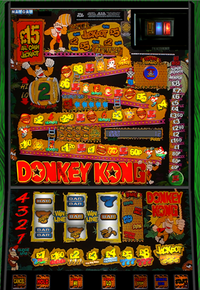 Donkey Kong is an uncommon European-only slot machine game licensed by Nintendo and developed by Maygay (who also made the machines) and released in 1996, being one of the first slot machines from the Mario and Donkey Kong franchises. The machine art is based heavily on the Donkey Kong arcade game, with some elements based on Donkey Kong Country. The objective of the game is to climb up to the jackpot bonus at the top of the machine, along the way jumping over barrels and climbing up ladders. Mario appears if the Super Mario button is pressed, giving extra cash, lives, or opening up the ladders. This page was last edited on March 22, 2018, at 20:58.